The Schema Library is a place to manage XML schemas. When you add a schema to the Schema Library, you create a namespace for any XML document in which the schema is attached. A namespace provides a unique identifier for elements defined by a schema. A namespace can also associate other XML related files, such as an XML Transformations file, to the XML document. An XML Transformations file (XSLT) is used to save and transform XML documents into other types of documents, such as HTML or XML, in different views. 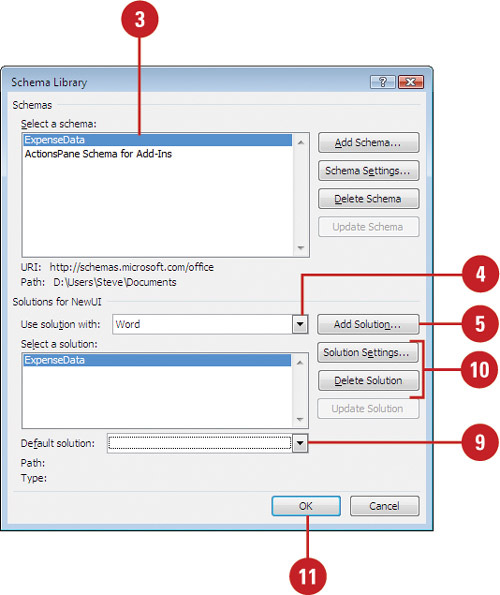 In the Schema Library, you can add, delete, update, and modify schemas and solutions, which are the files associated with the schema, such as XSLT. For example, you can add friendly names (aliases) to schemas and any files associated with the schema. You can add more than one schema to a single document. Word applies both sets of rules and alerts you of any conflicts. Click the Schema Library button. Click the schema you want to associate a transformation file (XSLT) with. Click the Use solution with list arrow, and then click Word. Locate and select the XSLT file, and then click Open. Type a name for the XSLT file, and then select the options you want. Click the Default solution list arrow, and then click the default transform you want. To delete a solution or update settings, select the solution, and then click Delete Solution or Solution Settings. Open the document you want to save as an XML document. 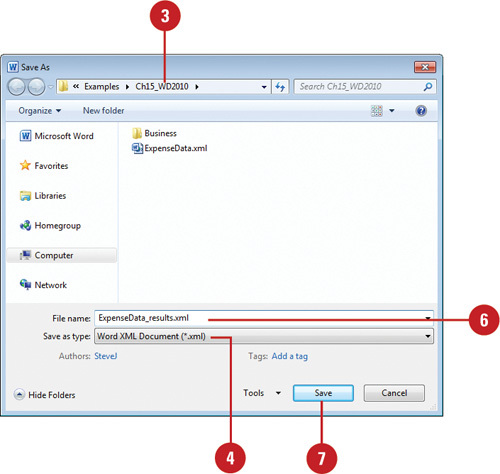 Select a location where you want to save the XML data. Click the Save as type list arrow, and then click Word XML Document or Word 2003 XML Document. For a Word 2003 XML Document, select the Save data only check box to save only XML data (disregard Word formatting). To apply a transformation, select the Apply transform check box, click Transform, select a transformation file (XSLT), and then click Open. Type a name for the XML document. You can insert XML data. Place the insertion point where you want to insert the data, click the Insert tab, click the Object button arrow, click Text From File, click the Files Of Type list arrow, click XML Files, locate and select the XML file, and then click Insert.